Sure, socially-powered recommendations or good old-fashioned serendipity can be useful tools for discovery, but, when it comes to deciding where you’re going to take the family on vacation, you’re probably not going to just throw a dart at a dartboard and wing it. You’re probably going to spend some time researching and try to make an informed, democratic decision. If that’s the case, would you trust a travel site to pick a destination for you? Probably not. But what if relinquishing part of that choice meant you’d be able to purchase tickets for up to 40 percent less? GetGoing, a San Francisco-based startup that launched last week, is betting that it can get you to roll the dice by doing just that. 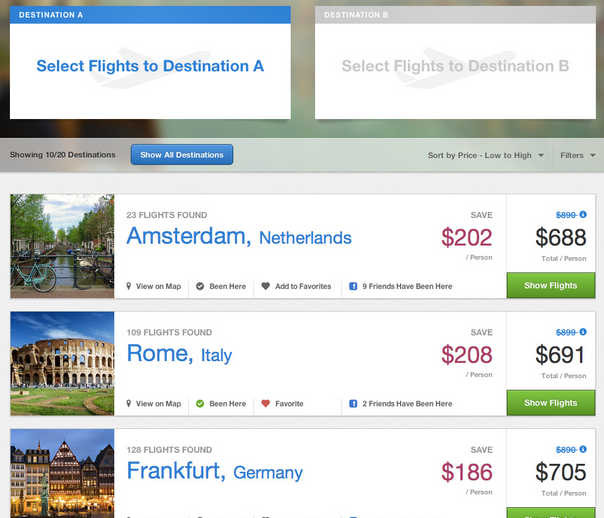 GetGoing graduated from Y Combinator last summer on a mission to help travelers find discounted airfare. But that’s a difficult proposition. Of course, nearly all travelers are familiar with the seemingly ever-escalating price tag that comes with flying, and the struggles of the major airlines to remain profitable are well known. The high price of fuel, along with the high costs of building, operating and maintaining equipment and the unpredictability of weather and other exogenous events on businesses make for slim margins for airlines. In combination, they’ve forced airlines to charge for every conceivable convenience and raise ticket prices. But another contributing factor to the unprofitability of major airlines — something they’re not eager to report — is that they lose billions of dollars every year on unsold inventory, GetGoing co-founder and CEO Alek Vernitsky tells us. Nearly 20 percent of all airline seats fly empty, which translates to about 160 million unsold tickets each year and approximately $25 billion in lost revenues for airlines in the U.S. While airlines would like to offer discounted tickets, as they realize the high price and extra fees at every turn makes for a crappy customer experience, the dirty little secret is that they don’t do it more often because they don’t want to lose the extra revenue they get from business travelers. They want to offer discounts to the Average Joe, but they’re so cash-strapped that they feel they can’t include business flyers, who typically pay higher rates to fly, because their travel dates, itinerary (and general demand) is relatively fixed. What’s more, airlines also don’t want to cannibalize business from their digital lead-gen partners, like Expedia, which send them a lot of traffic. So, writ large, providing the right incentives for airlines to offer significant discounts is a tall order for startups and businesses inclined to tackle the problem. The decision to provide their data or partner with third-parties is something that happens at the board or C-suite level, Vernitsky says. It’s not a decision that’s made lightly, and doesn’t happen overnight. While most of its fellow startups from Y Combinator’s Summer 2012 batch have already launched, GetGoing had a longer road because it had to create a model that would appeal to both airlines and consumers — and hold the hands of airlines through a slow partnership process. At launch, however, the startup has deals with more than 10 of the major domestic and international airlines — deals that it has been able to ink because its technology allows carriers to distribute discounts to flexible, leisure travelers — and leisure travelers only. That is where this aforementioned element of choice (or lack thereof) comes into the picture. Here’s how it works: Users sign on to GetGoing via the usual process or through Facebook (I recommend the latter), at which point you can search for routes to over 1,000 destinations in 50 countries (and growing). The service allows you to select from particular regions (like “Africa & Middle East” or “Mexico & Caribbean”) and custom lists and categories (like “Adventure & Outdoor” or “Beaches & Sun”), or you can create your own. Once you’ve specified your dates and chosen your general destination category, GetGoing populates results with destinations (usually less than 20), which you can sort based on price or by those recommended specifically for you. Users can also filter based on how many stops the flights will make and by departing and arrival times (a la Kayak and Hipmunk). After whittling your picks down to two destinations (and after customizing the arrival and departure times, price and duration and so on), GetGoing then randomly books one of those two itineraries, only revealing the final destination after it has processed your payment. The idea, of course, is to get you tickets at prices that are significantly discounted. For example, I chose two tickets to Nassau (Bahamas) for $825 and San Juan (Puerto Rico) for $555, which GetGoing says saved me $250 and $195, respectively. The cheapest comparable ticket I could find via U.S. Airways (with 1 stop) was about $980. Definitely favorable in comparison, though not quite as much as GetGoing advertised. The startup claims to be able to get 20 to 40 percent discounts on its tickets on average, and to its credit, follow up searches all yielded discounts in that range. In theory, this model allows airlines to provide discounts only to those flexible leisure travelers, while selling unsold seats and protecting existing yield from business travelers. In turn, it enables to find better deals (nationally and internationally) across a growing set of carrier, to travel more often, spend less and explore destinations that may have otherwise been unaffordable. In addition, the GetGoing co-founder says that the selling point for airlines has been that if the service can find at adoption at scale, it could help them add $200 million to their bottom line, while providing an alternative distribution channel. “To be able to lower the price for a particular segment of their customer base is huge for airlines,” he says, “but they haven’t done this before because of the friction and the cost to build the infrastructure.” What’s more, airlines wouldn’t create a third-party service that offers customers the ability to fly with one of their competitors. While there may be plenty of incentive for airlines, GetGoing’s model still requires a leap of faith from everyday flyers. If you’re willing to be more serendipitous in your vacation planning, the service could be appealing, but the fact of the matter is that not everyone will be comfortable with giving up that control. The service does include some nifty, Gogobot-like features in its destination search, allowing users to explore the destination on a map and view pictures, and see which friends have been there (if you’re logged in via Facebook). Users can do this from within search results, and the more information and ability to explore the destination GetGoing can provide, the better the experience becomes. To that point, one of the biggest missing pieces is that GetGoing does not yet offer travelers the ability to book hotels and travel packages alongside airfare — nor can you apply frequent flier miles because you don’t know what airline you’ll be traveling until you book. But the GetGoing co-founders tell us that hotels and travel packages are next on the to-do list — as are cruises. Adding these features (and mobile apps), stands to make the experience significantly more appealing for leisure travelers. And, from my perspective, the addition of this functionality has a big chance to override the difficulty of having to give up control of your final destination, especially if it can offer a way to apply frequent flier miles once booked. Today, the co-founders tell us that the startup has raised several “large seed rounds” from Yuri Milner and a host of other investors, and is in the process of closing its series A financing. With new capital in the bank, GetGoing plans to add to its team of 30+ and continue growing its roster of airline partners. The startup definitely has one of the more interesting models in the travel space, and it will be interesting to see if Average Joes like you and me will be willing to take the leap of faith in exchange for discounts. The more features it has, the more it can be cross-platform and provide transparency around pricing, the better the chances become. For more, find GetGoing at home here.